Travel Info Listed at bottom, below video. On Day 6 of our trip to Alaska we drove clean out the other side of Anchorage and headed upstate. We crossed the Yentna, Trapper Creek, Eagle River, Answer Creek, got in a plane and flew across the Talkeetna River and right smack up to its source, massive glaciers. That flight, my friend was the best part of our trip. And that will be my next Alaska post. 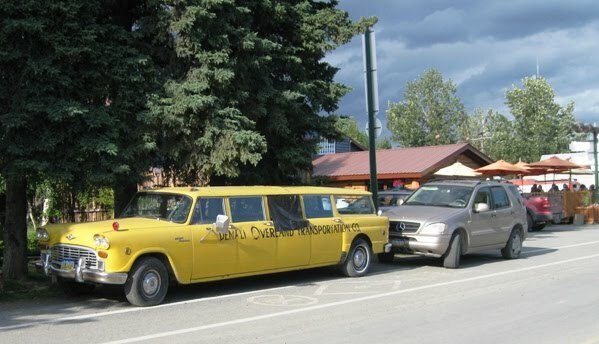 Let's enjoy the drive to Talkeetna. The scenery up here is a little different than the coast. Fill your gas tank when you leave Wasilla. After that, there isn't much of anything. 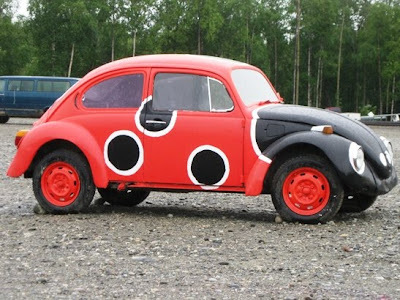 There are a few signs of life, such as this car, scattered here & there, but they didn't do much to instill confidence in us. 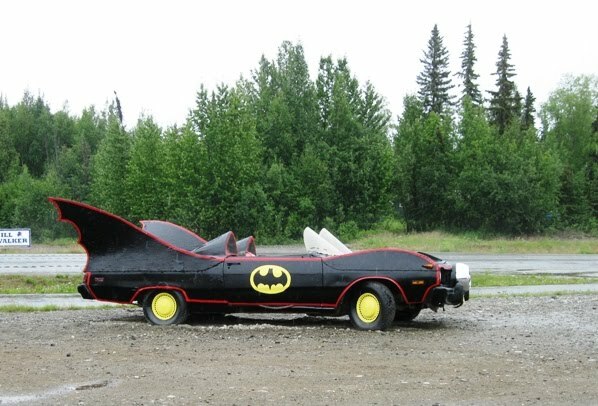 And then, verrry cool, we passed Bat Man. 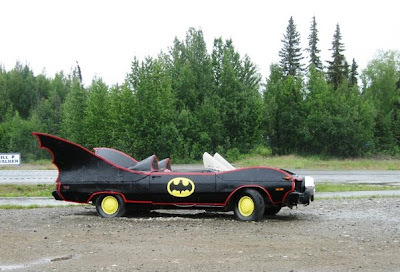 Have you ever passed Bat Man? 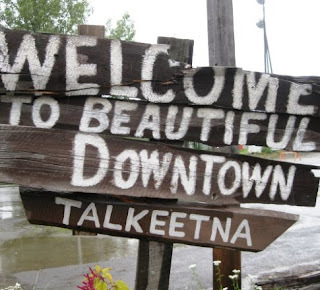 After a few hours of driving, somewhere around mile 99, we hung a hard right and entered Talkeetna. I mean, "downtown" Talkeetna. Which had more than a few similarities to my town. This -- and beyond -- is the area of Alaska where they use float planes like we use pick-up trucks. The Alaska Train swings through here and this one highway does. Go any further and you get around by 4-wheeler, snowmobile, dogsled or float plane. As we conquered Alaska, town by town, one image was constant: Doug approaching a stranger, hand extended, saying "Doug Busbee. South Carolina. Nice to meetcha." And then he'd talk for 30 minutes or so with his new friends. 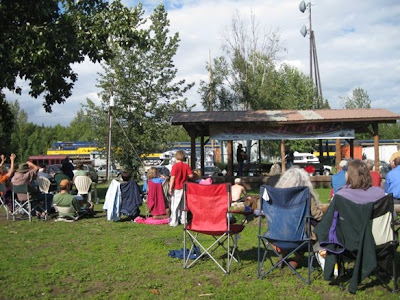 So as we rounded the bend into Downtown Talkeetna, windows open, the whole town a festival, we heard revellers outside our window. One said, "Did you see who's here?!?" Tom & I exchanged a glance, smiled and said, "Doug Busbee. From South Carolina." Seriously, the town was in mid-festival when we arrived. This little country town having an outdoor concert in the park with everyone in lawn chairs - oh man, Tom and I thought this was Heaven. As soon as we parked, we headed over to hear some local music. Doug and Jackie nested a little and then walked around town to see what we could do. One of Doug's new friends urged him to take the Glacier Flight Tour, I'm so glad he did. The men outnumber the women by 3-1 in this part of Alaska. We were staying at The Roadhouse. Our waitress (Sue) had been there 20 years; one of Doug's friends, 27 years. The friend fondly recalled, "Yeah, I remember when Sue came to town. There was a bidding war for her." 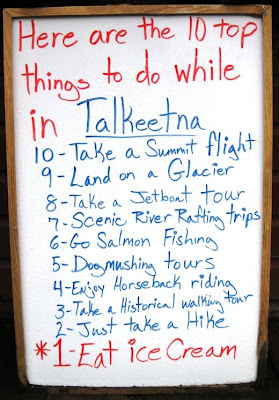 The activities around Talkeetna make it worth the trip. 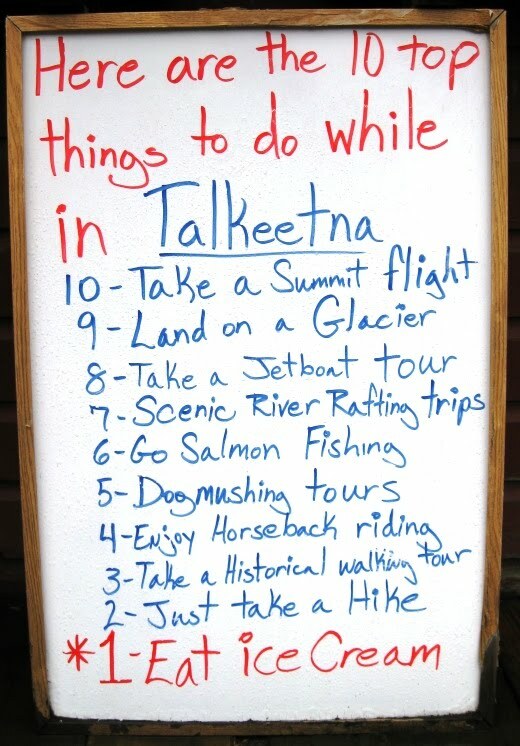 If you go to AK, spend a couple days in Talkeetna. The town has one strip with a few restaurants, a little outdoor seating, and a couple of Inns. The food we had was outrageously good. The Roadhouse breakfasts are incredible. I'd probably skip Denali Nat'l Park, but I'll do a post on it and you can decide for yourself. 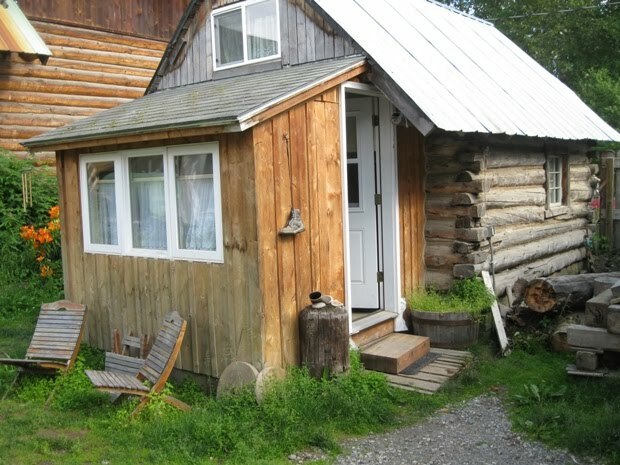 In the Talkeetna area, there's fishing, hiking, boat tours and flight tours that can take you to see Mt. 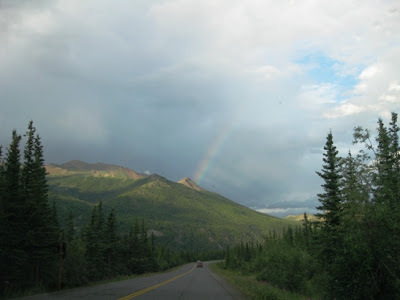 McKinley, bears and wildlife. We didn't see a whole lot of wildlife at Denali Nat'l Park, but it was pretty scenery. 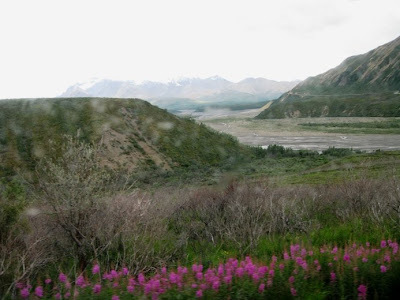 Denali State Park is also nearby and I've heard good things about it. We stayed two nights at The Roadhouse and it was just good, old fun. Our cabin was surprisingly tiny and we had to sleep 6 in it. The bathrooms are in the main building and all guests share the bathrooms and showers. I had to wait one day, maybe 15 minutes for an empty shower, but otherwise, it wasn't too inconvenient and was well worth the fun. Just hopping by on the Blog Hop! Thanks for stopping by to say "hello!" Sounds like you had quite a trip in Alaska. Can't wait to read more about it!